A second half double-shot from the Cowboys has helped them to a 12-point win over the Knights this evening at 1300SMILES Stadium in front of over 13,000 fans. GET all the Late Mail ahead of tonight's clash between the Cronulla-Sutherland Sharks and the Gold Coast Titans. IT was a Corey Norman inspired Parramatta Eels that trampled over the Penrith Panthers in the local derby, 18-12 in front of 14,070 fans at ANZ Stadium. ALL the results and scorers from the second weekend of the NSWRL SG Ball Cup Finals Series. GET all the Late Mail ahead of this afternoon's game between the North Queensland Cowboys and the Newcastle Knights at 1300SMILES Stadium. ALL the results and scorers from the second weekend of the NSWRL Harold Matthews Cup Finals Series. ALL the results and scorers from the second week of the NSWRL Tarsha Gale Cup Finals Series. GET all the Late Mail ahead of this afternoon's game between the Parramatta Eels and the Penrith Panthers. THE charges from Round 8 as they become available plus results right across the weekend and into next week. ANDREW Jackson previews this weekend's clash between the Cronulla-Sutherland Sharks and the Gold Coast Titans at Southern Cross Group Stadium. A series of contentious calls have reigned supreme in a thrilling contest between Brisbane and Souths at ANZ Stadium tonight, with the Broncos prevailing 25-24. THE Manly Sea Eagles have won a thrilling contest at GIO Stadium tonight, with a Dylan Walker penalty goal from 40 metres out in golden point handing them a 20-18 win over the Canberra Raiders in front of 15976. 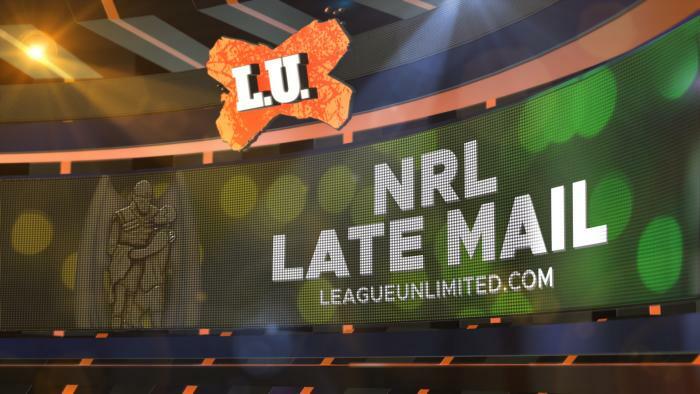 GET all the Late Mail ahead of tonight's clash between the South Sydney Rabbitohs and the Brisbane Broncos. GET all the Late Mail ahead of tonight's clash between the Canberra Raiders and the Manly-Warringah Sea Eagles. IN some outstanding news for the Sharks ahead of their match with the Gold Coast tomorrow night, half-back Chad Townsend has extended his stay at the club in re-signing for a further 3 years. MELBOURNE Storm have strengthened their forward pack for the future with Christian Welch and Felise Kaufusi committing to the Club. ALL the teamlists and officials for Round 6 of the Brisbane Rugby League A Grade - In Safe Hands Cup. JACK Clifton casts his eye over Saturday's game between the North Queensland Cowboys and the Newcastle Knights at 1300SMILES Stadium.